« BIG LOVE S4 premiere sneak peeks! Tonight is the big 450th episode of THE SIMPSONS and an all new two hour block of CHUCK premieres! Let’s see what else is on? The EXTREME MAKEOVER: HOME EDITION featuring David Cook and Xzibit is on ABC. Over on CBS, there’s a rerun of NCIS:LA – catch the pilot episode again – see where it all started! NBC has the second hour of a two hour DATELINE NBC dealing with the failed Christmas Day bomber. The 45oth episode of THE SIMPSONS airs on FOX at 8. Krusty the Clown is back, and he’s teaming up with Anne Hathaway’s Princess Penelope, which the plant workers fight with Mr. Burns. 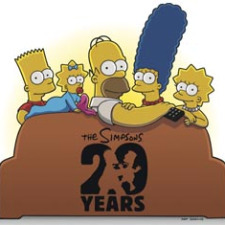 At 8:30, Morgan Spurlock (30 DAYS) interviews fans, and cast members, about THE SIMPSONS in the 20th Anniversary special that runs for an hour. Food Network has an all new episode of the FOOD NETWORK CHALLENGE – dealing with Newlywed Cakes. ABC has an all new episode of DESPERATE HOUSEWIVES – something about Susan stripping and Bree feeling bad about hurting Orson. CBS has an all new episode of COLD CASE – the 2005 murder of an army recruiter is investigated. The 20th Anniversary special continues on FOX, leading into an all new episode of THE CLEVELAND SHOW featuring the voice stylings of Jane Lynch!! NBC has the most important thing you’ll watch all weekend – the Season 3 premiere of CHUCK! In hour 1, Chuck is back and training to use the newest intersect to help him as a spy. Food Network has an all new episode of IRON CHEF AMERICA. The Season 4 premiere of BIG LOVE is on HBO at 9. There is an investigation into Roman’s whereabouts after the Season 3 finale. Syfy is airing BATTLESTAR GALACTICA: THE PLAN – learn how the Cylons view life after they bombed the colonies! ABC has an all new episode of BROTHERS AND SISTERS – Laura Innes directs an episode where Sarah once again meets a new guy. A repeat of CRIMINAL MINDS airs on CBS – the fifth season premiere where Hotch went missing! NBC has hour 2 of the CHUCK premiere – Karina is back, with her fiance, this time, played by Vinnie Jones! You’ll find an all new episode of THE JACKSONS on A&E. Syfy has THE PLAN going through the hour. An all new episode of WORST COOKS IN AMERICA airs on Food Network as the chefs learn some knife skills. Finished my complete season 2 recap on Blu-Ray–ready for the Chuck premiere. Can’t believe Simpsons has hit it’s 450th episode–been watching since the Tracy Ullman show!